Pears are in the air. I had a very nice pear cocktail a couple of nights ago that I have yet to post in the Death & Co thread. Meanwhile, here is a Gin Smash. I thought that it was a proper way to inaugurate a new bottle of Sipsmith gin and appreciate all its nuances. Gin Smash a la Dale DeGroff with Sipsmith London dry gin, lemon wedges, simple syrup, mint, Angostura bitters. 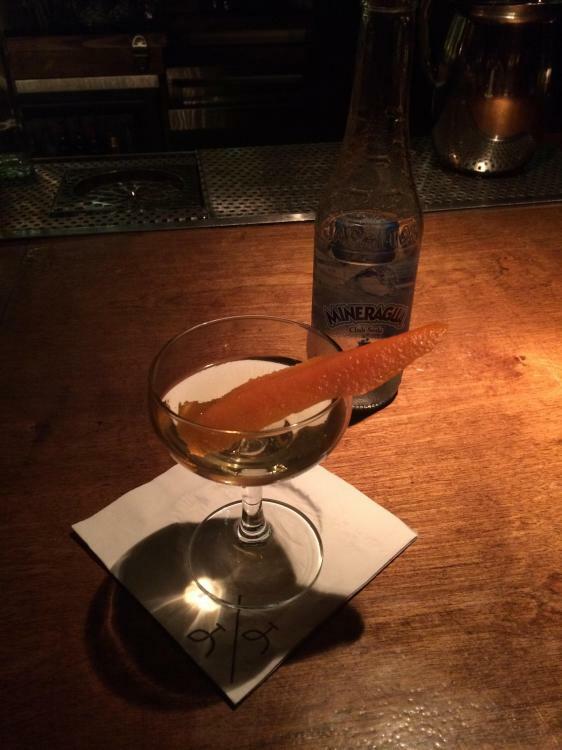 Another favorite cocktail with this interesting gin - Ada Coleman's Hanky Panky with the ratios from PDT. The Martini Gran Lusso vermouth works really well here as it has a strong personality and a tinge of bitterness that echoes the Fernet. Tried The Warning Label tonight. Looked to be forbiddingly intense, since everything on the ingredients list that isn't bitter, is highly flammable! 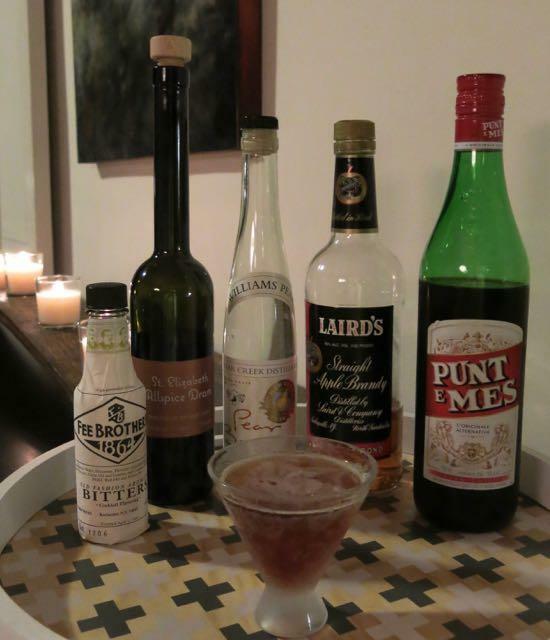 Lemon Hart 151 (Hamilton 151), Cynar, Punt E Mes, Regan's, grapefruit bitters (hop bitters, why not? ), Campari rinse, lemon twist. In actuality I found this quite drinkable. I realize in retrospect that adding something bitter to something bitter doesn't necessarily make it more bitter; and there's a healthy dose of sweetness in the Demerara rum and the Cynar and the vermouth that stands its ground against the bitterness. I got a good squirt from a sizable and fresh lemon zest, which added welcome brightness. One of the rare times when what I worked out in my mind's tongue actually turns out well. This is awesome, bursting with lively berry flavor with a lovely background of bitter woody tones. These cherry bark vanilla bitters seem made for this whiskey, despite them coming for very different parts of the country. Yesterday's Manhattan with High West Double Rye!, Martini Gran Lusso vermouth, Abbott's bitters, an orange twist and a brandied griotte cherry. Spice-forward and slightly bitter with the Gran Lusso. From last week, a Negroni with Old Harbor San Miguel Southwestern gin, Martini Gran Lusso vermouth, Campari. This is tasty. The vermouth is rich but with a pronounced bitterness that is nice here. The gin which is made in San Diego is very savory and I've been enjoying it in Negronis. It works also great in Gin & Tonics, and a delicious tomato-less Bloody Mary variation called Gordon's Breakfast. It's been a while, so a Widow's Kiss. For my shift drink, an Alaska. St. George Terroir, yellow Chartreuse, orange bitters, lemon twist. Pretend the forum software attached this image correctly. 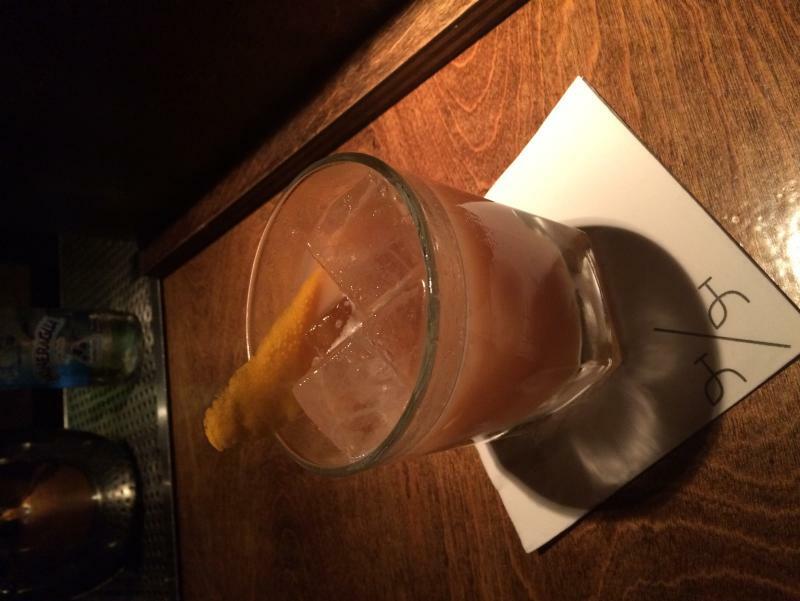 Another shiftie, a Rye Tai. 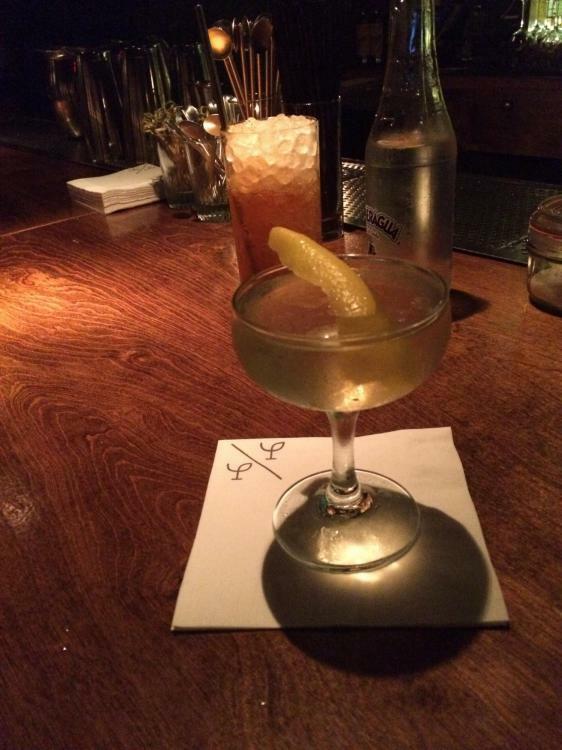 Whistlepig, PF dry Curaçao, pistachio orgeat, lemon, Ango bitters. Last winter we were developing recipes for our DIY Tiki Mixers Kit and there are only so many Pearl Divers and Zombies I can drink when it's 20° out. So I made a variation on hot buttered rum that I call Toasted Tiki Buttered Rum. Browning the butter and blooming the spices in the hot butter makes it taste like a mug full of warm molasses cookies. Pairs well with a warm blanket and a netflix subscription. If you're making several, it can be difficult to distribute the butter and milk evenly so I find it's easier to heat the butter mix and milk mix in separate pans and then measure them into the mugs and stir. I suspect this drink might be a little boring with stock vermouth, but with Punt e Mes providing a slight bitter edge I like it. I taste prunes and a little smoke. 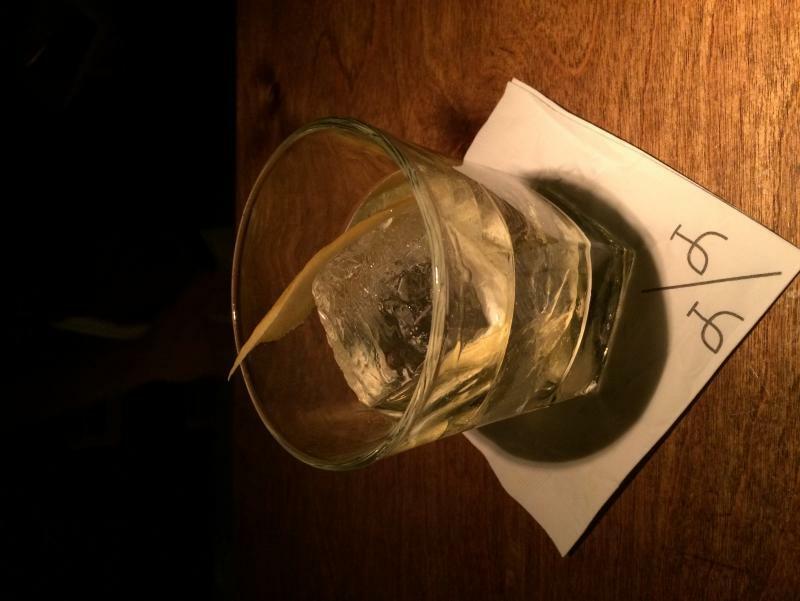 This looks very much like the bourbon version of a classic rye cocktail called the Preakness. What is that red-labeled bottle in your Preakness pic? French brandied guinettes (a type of griotte cherry), made in Perigord. Which, in my opinion, blow Luxardo maraschino cherries out of the water. Last night's shift drink, which I foolishly forgot to photograph before I started drinking. Dolin dry and blanc vermouths, Blume Marillen apricot eau de vie, orange flower syrup, orange bitters, big old orange twist. A friend said it tasted like tepache, the fermented pineapple rind beverage popular in parts of Mexico, and I kind of agree. Last night I made Creole Cocktails for a crowd with Prichard's rye whiskey, Martini Gran Lusso vermouth, Picon biere, Benedictine, Angostura bitters, orange peel garnish (Bartender's Choice app ratios). Nice and warming; that combination worked really well (I love the slightly bitter notes of that vermouth, they make everything else pop). Of course I forgot to take pictures! Ahhhh! The first Réveillon of the season for me! Also the first I've tried with Punt e Mes instead of Carpano Antica. I think the Punt e Mes helps conjure up a spicy Christmas Tree while Carpano Antica has the eggnog and sugarplum fairies covered - both good! I'm missing the cinnamon stick garnish and this is still just the thing to put me in a holiday mood but I'd better track down another bottle of Laird's for more careful testing. 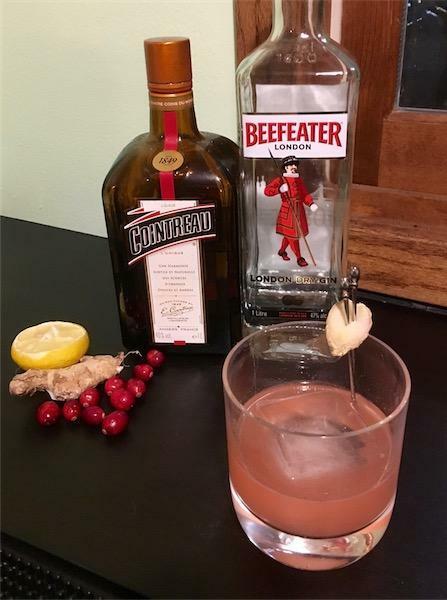 I've done a similar cranberry gin smash before, but the ginger is a really nice addition. EDIT: only now noticed that the original recipe adds sugar to the muddle, which was omitted in the Kindred Cocktails recipe linked above. But it doesn't need it. Perhaps the sugar would help better draw out the juices of the cranberries, but the ounce of Cointreau added enough sweetness. Tonight's: St. George Terroir, St. George pear eau de vie, Dimmi, Bénédictine, orange bitters, lemon oil. The crushed ice drink in the background is just soda and bitters. As for the past thousand times or so I was mixing up my mai tai -- giving it the full forty five second ludicrously violent shake -- when my peripatetions about the kitchen (and, if I may add, living room and dining room) were interrupted by a sudden nosebleed. I may be too old for this. Then when finally able to enjoy my chosen beverage in peace, I chomped down on a peanut whilst neglecting to remove my finger first. I have one lime left, although tomorrow is a workday. 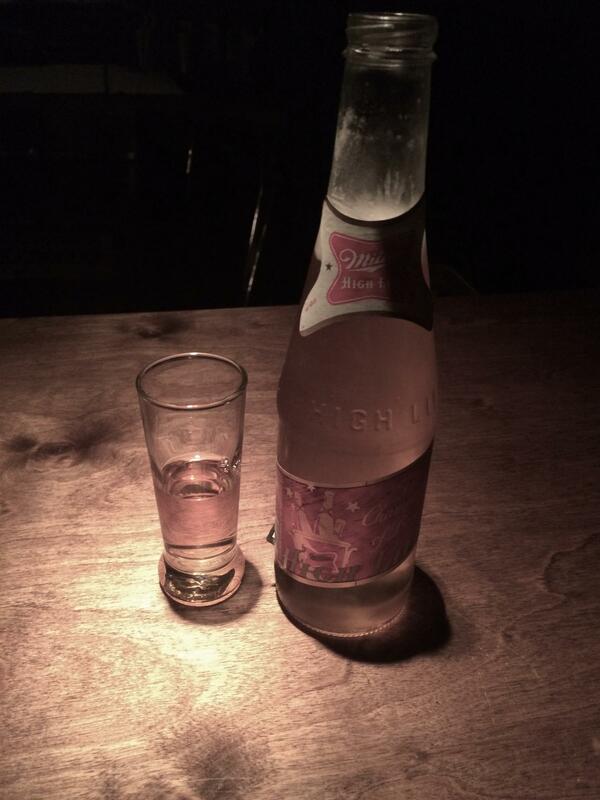 Whatever the beverage that is a gorgeous photograph. Finally got my hands on a bottle of Gran Classico, so the other day I made the Negroni variation suggested on the bottle. Really, really nice. So good that when my friend came over for drinks later that evening, instead of asking him what he wanted, I just began preparing him one of these. He loved it as much as I did. I just realized I forgot to add sugar to my Mississippi punch. I guess that means it's not much of a punch. But what's not to like about two ounces of freshly expressed lemon juice and four ounces of overproof rum and brandy?